You must have noticed that I don’t cook many lunches. I am usually so busy that I will eat on the run. I will usually have whatever is left-overs; it can be soups, salads… But with teenagers in the house, it is imperative to have things in the fridge that will cater to their enormous appetite. My husband being from Germany, always order some cold cuts for fixing sandwiches so I have to think to buy bread or various sauces to fix those sandwiches. This week-end however, I could not stop from buying those yummy looking croissants they had standing in the entrance way of the store ( why do they do that?!?! tempt you all the time;-) So instead of eating them up, breakfast was already past.. I decided I would fix Croissant Croque Monsieur for their lunches. The word “Croque” means Crunchy, the word “Monsieur” means Mister. “The reason behind the combination of the two words is unclear—and is colloquially shortened to croque. While the origins of the croque-monsieur are unknown, there are many speculations on how it was first created. The croque-monsieur’s first recorded appearance on a Parisian café menu was in 1910. Its earliest mention in literature appears to be in volume two of Proust’s Remembrance of Things Past (À la recherche du temps perdu) (1918)” Wikipedia. 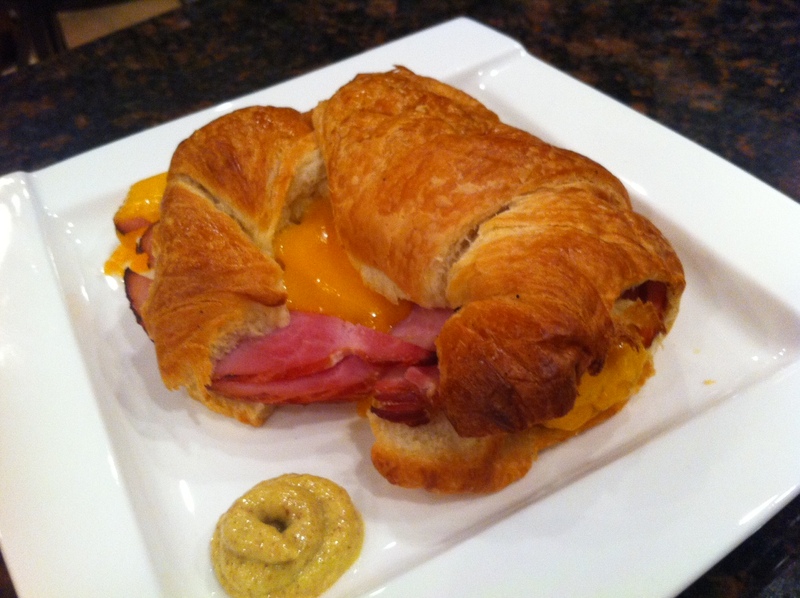 Ingredients for each person: 1 large croissant, 2 slices of Smoked Ham, 2-4 slices of sharp cheddar or cheese of your choice. Slice the croissant in half in its length, then spread a bit of butter on one side of the croissant and a little bit of mustard (Dijon, or honey-mustard on the other half). Place the slices of meat on top of the bottom half of the croissant, then place the cheese and place the other half of the croissant on top. Cook in a Panini press, or place in a warm oven and cook for 10 minutes at 350. Et voila. Serve with a salad and more mustard.